There is an established array of scientific, social and economic reasons why the mid-elevation Mount Elphinstone slopes should be considered for protection under BC’s Protected Areas Strategy. Presently three separate parcels of forests, totalling 139 hectares, make up Mt. Elphinstone Park. The SCCA believes it is time to move forward and create a contiguous mid-elevation park on the western slopes of the mountain. This important subzone is critically under-represented locally, regionally and provincially in BC’s protected areas system. 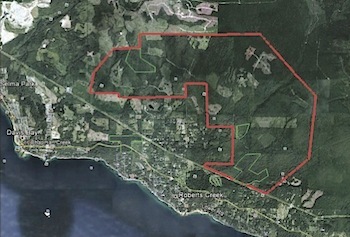 With the addition of the SCCA now supporting the majority of the sunshine coast calling for the protection of the Wilson Creek Forest (cutblock EW002) we are asking the District of Sechelt (Mayor and council) and the SCCF* (Sunshine Coast Community Forest) to have the foresight to plan for the future and listen to the community (Call for protection is also supported by the RCCA (Roberts Creek Community Association), Davis Bay and Wilson Creek Associations) and do the right thing and stop the proposed logging of this ‘Jewel’ of a forest, one of the last unlogged intact forests in the already over logged (86%) Wilson Creek Watershed. Their mission is pursued through educational outreach to First Nations, regional governments, civic organizations, industrial stakeholders and the general public. Their activities include publishing, researching, public speaking and hosting educational forums. Assisting our member groups in achieving their conservation objectives is an important role of the SCCA, as is assisting other community organizations with their environmental concerns. We are also a watchdog and advocate, holding decision-makers to account when conservation assets are at risk and encouraging government though educational and legal means to follow its own regulations.